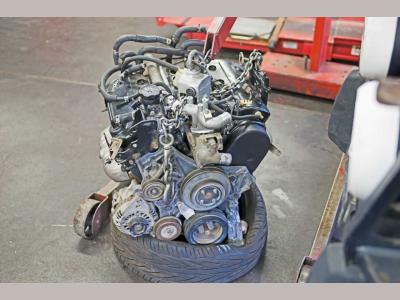 After a bit more than 530,000 miles the number three cylinder in the original 3.0L engine of my 1997 Montero Sport decided that it had finally had enough. While the rest of the cylinders were still showing 150-160 PSI there wasn't much point in trying to fix one cylinder in an engine with that much miliage. It was time for a new engine. 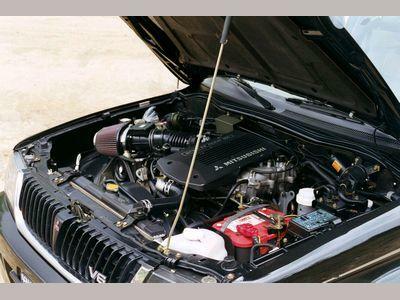 Several years ago another Montero Sport owner had transplanted a 3.5L into his 3.0L automatic Sport with little effort and was very happy with the results. The weight from bigger tires and heavier rims, recovery gear, and body armor adds up fast so the extra torque and horsepower was welcome. At that time my engine was running fine so I couldn't justify the expense of replacing a working, if slightly underpowered, engine. I'd mentioned it to the technicians at the dealership that do some of my general maintenance on my Montero Sports. They thought it would be an interesting project and definitly a jump up from the 3.0L in power, but since I didn't have any near future plans there were no further discussions. The project was postponed indefinitley. The low cylinder pressure problem was discovered while trying to track down electrical and a cylinder miss problem. Most of the top of the engine was already off when we discovered the culprit. There was no reason to put 3.0L back together. Cylinder #3 was only going to get worse and it was unlikely the engine would pass emissions in another year. At that point, we decided our options were to either rebuild the existing engine, buy a new or rebuilt engine or buy a used engine. I wasn't really prepared for this so I was kind of at a loss. Bringing up our previous discussions from a couple years prior, the service manager and technician sugested getting a used 2000's 3.5L and swaping it in rather than doing something with my original 3.0L. 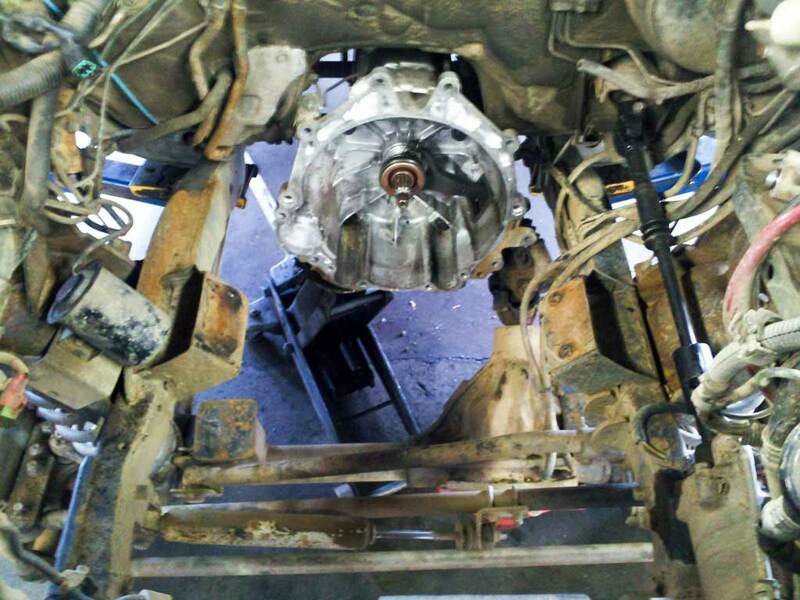 I wasn't sure that something like this was ok - dealerships usually don't engage in engine swaps and fabrication - but the service manager and technician assured me multiple times it was fine with the owner. 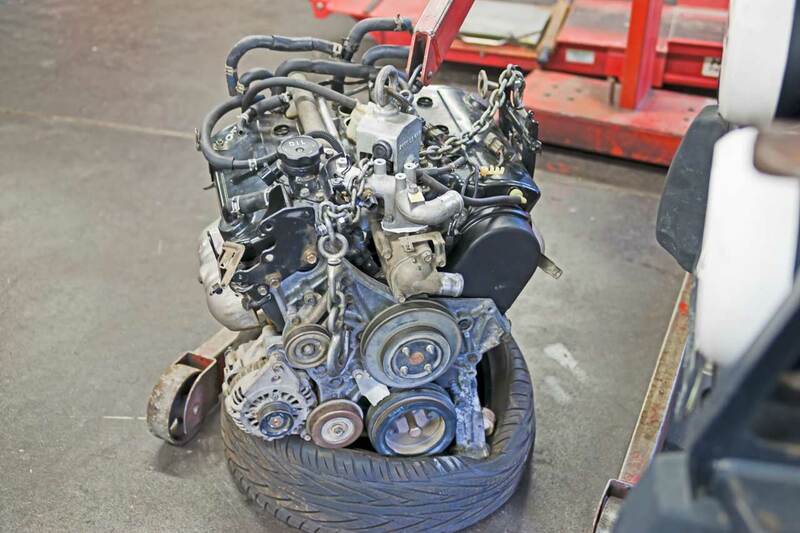 Far be it for me to throw a wrench into their fun, so a few days later a pallet showed up with a 3.5L with only 50,000 miles on it out of a 2002 Mitsubishi Montero Sport Limited 2-wheel drive. The engine was complete, missing only the starter, air conditioning compressor and power steering pump. Since almost everything on the front of my 3.0L engine was virtually new - having less than 10,000 miles - the technician decided to swap those parts to the 3.5L. The deck height of the 3.5L is 18mm higher than the 3.0L so timing and power steering belts were not interchangeable, but everything we were interested in swaping transfered over with no issues. The next part was the throttle body. 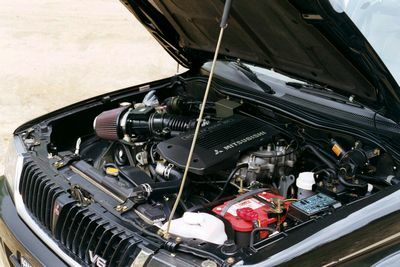 The Montero and Montero Sport 2000+ engines use a different cruise control setup than the 1997-1999 engines. In addition, the Idle Air Control valve (IAC) and Throttle Position Sensor (TPS) are different. Either throttle body will bolt to the 3.5L manifold so the 3.5L throttle body was swaped for the 3.0L throttle body with the correct IAC, TPS and air conditioning pieces. Once the top end was reassembled with the 3.0L throttle body it was time to reattach the throttle cable. With the throttle cable bracket mounted to the manifold the technician found that the cable couldn't be reattached to the throttle body. A little work on the bracket where it bolts to the manifold fixed the problem. Replacing the wiring harness was relatively simple. A loom bracket here and there needed to be tweeked slightly but otherwise it wasn't any different than replacing the wiring would have been if I'd gone with the 3.0L. One problem did crop up, however. While reassembling the top end we noticed that the location of the coolant temperature sensor had changed. This is the temperature sensor for the dash, not the Engine Coolant Temperature (ECT) sensor used by the Engine Control Unit (ECU) (also known as the Engine Control Module (ECM)). For whatever reason Mitsubishi chose to relocate the sensor by a couple inches which makes the sensor wire too short. The sensor uses a single wire so the the easy fix was to extend the sensor wire.